Chinese hibiscus - Hibiscus rosa sinensis flowers are gorgeous tropical plants but they are not so easy to grow in temperate regions. 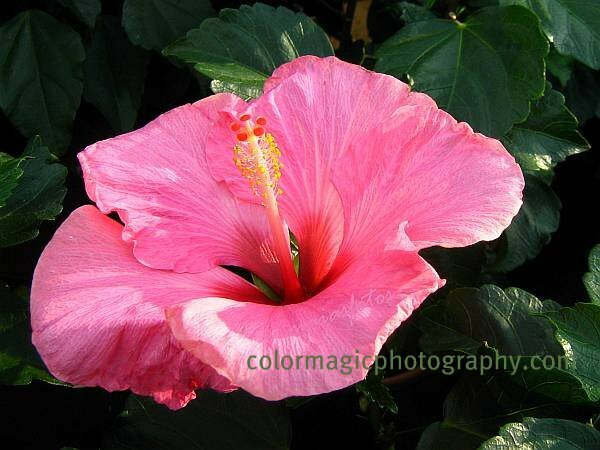 I took this photo of this lovely pink hibiscus, at the garden center. Even they have problems with offering proper conditions for these evergreen hibiscus shrubs. Each of these exotic hybrids perform well in different conditions, some prefer more sun and some, more shade. These beautiful ornamental plants bloom all year by us indoors, being protected by extreme summer heat and cold winter temperatures. They require much light though, they do well in a South facing windows or in the morning sunlight. Hybiscus flowers are edible in salads and have medical uses in herbal medicine. In India, the flowers are used to shine shoes, where its other name,shoe flower, comes from. See some more hibiscus photos at this earlier post. These are one of the most beautiful flowers ever. I just have no luck growing them. My neighbors have some very pretty bright red ones.